This website would like to place cookies on your computer to improve the quality of your experience of the site. To find out more about the cookies, see our privacy notice. Apple iOS and Android devices. To download on your device search for “Risk Group Database” in Apple’s iTunes App Store or in the Google Play App store. *Please note, the Biosafety in Microbiological and Biomedical Laboratories, Fifth Edition. (2009) or “BMBL” outlines biological safety levels (BSLs), which are distinct from risk group levels. A proper risk assessment for biological agents must always be conducted before establishing a biological safety level. Feedback about the Risk Groups Database? Four Biosafety Levels (BSLs) are described in Section 4, which consist of combinations of laboratory practices and techniques, safety equipment, and laboratory facilities. Each combination is specifically appropriate for the operations performed, the documented or suspected routes of transmission of the infectious agents, and the laboratory function or activity. 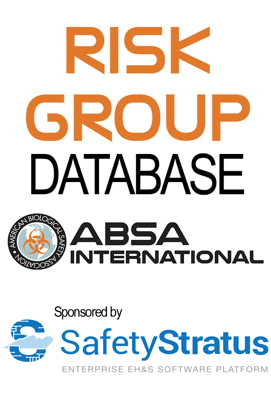 The BSLs described in this manual should be differentiated from Risk Groups, as described in the NIH Guidelines and the World Health Organization Laboratory Biosafety Manual. Risk groups are the result of a classification of microbiological agents based on their association with, and resulting severity of, disease in humans. The risk group of an agent should be one factor considered in association with mode of transmission, procedural protocols, experience of staff, and other factors in determining the BSL in which the work will be conducted. U.S. Department of Health and Human Services, Centers for Disease Control and Prevention and National Institutes of Health. “Biosafety in Microbiological and Biomedical Laboratories, Fifth Edition.” (2009). Biosafety Level 1 (BSL 1): suitable for work involving well-characterized agents not known to consistently cause disease in immunocompetent adult humans, and present minimal potential hazard to laboratory personnel and the environment. Biosafety Level 2 (BSL 2): builds upon BSL-1. BSL-2 is suitable for work involving agents that pose moderate hazards to personnel and the environment. Biosafety Level 3 (BSL 3): applicable to clinical, diagnostic, teaching, research, or production facilities where work is performed with indigenous or exotic agents that may cause serious or potentially lethal disease through the inhalation route of exposure. Biosafety Level 4 (BSL 4): dangerous and exotic agents that pose a high individual risk of aerosol-transmitted laboratory infections and life-threatening disease that is frequently fatal, for which there are no vaccines or treatments, or a related agent with unknown risk of transmission. Risk Group 1 (RG1) agents are not associated with disease in healthy adult humans. Risk Group 2 (RG2) agents are associated with human disease which is rarely serious and for which preventive or therapeutic interventions are often available. Risk Group 3 (RG3) agents are associated with serious or lethal human disease for which preventive or therapeutic interventions may be available. Risk Group 4 (RG4) agents are likely to cause serious or lethal human disease for which preventive or therapeutic interventions are not usually available. WHO Basis for Risk Grouping: Each country classifies the agents in that country by risk group based on pathogenicity of the organism, modes of transmission and host range of the organism. These may be influenced by existing levels of immunity, density and movement of host population presence of appropriate vectors and standards of environmental hygiene. Availability of effective preventive measures. Such measures may include: prophylaxis by vaccination or antisera; sanitary measures, e.g. food and water hygiene; the control of animal reservoirs or arthropod vectors; the movement of people or animals; and the importation of infected animals or animal products. Availability of effective treatment. This includes passive immunization and postexposure vaccination, antibiotics, and chemotherapeutic agents, taking into consideration the possibility of the emergence of resistant strains. It is important to take prevailing conditions in the geographical area in which the microorganisms are handled into account. Note: Individual governments may decide to prohibit the handling or importation of certain pathogens except for diagnostic purposes. WHO Risk Group 1 (no or low individual and community risk). A microorganism that is unlikely to cause human disease or animal disease. WHO Risk Group 2 (moderate individual risk, low community risk). A pathogen that can cause human or animal disease but is unlikely to be a serious hazard to laboratory workers, the community, livestock or the environment. Laboratory exposures may cause serious infection, but effective treatment and preventative measures are available and the risk of spread of infection is limited. WHO Risk Group 3 (high individual risk, low community risk). A pathogen that usually causes serious human or animal disease but does not ordinarily spread from one infected individual to another. Effective treatment and preventive measures are available. WHO Risk Group 4 (high individual and community risk). A pathogen that usually causes serious human or animal disease and that can be readily transmitted from one individual to another, directly or indirectly. Effective treatment and preventive measures are not usually available. Risk Group 1 (low individual and community risk) – a microorganism that is unlikely to cause human or animal disease. Risk Group 2 (moderate individual risk, limited community risk) – a microorganism that is unlikely to be a significant risk to laboratory workers, the community, livestock, or the environment; laboratory exposures may cause infections, but effective treatment and preventive measures are available, and the risk of spread is limited. Risk Group 3 (high individual risk, limited to moderate community risk) – a microorganism that usually causes serious human or animal disease and may present a significant risk to laboratory workers. It could present a limited to moderate risk if spread in the community or the environment, but there are usually effective preventive measures or treatment available. Risk Group 4 (high individual and community risk) – a microorganism that usually produces life-threatening human or animal disease, represents a significant risk to laboratory workers and may be readily transmissible from one individual to another. Effective treatment and preventive measures are not usually available. Class of risk 1: micro-organisms known as nonpathogenic for the man, the animal, the plant and not-harmful for the environment or presenting a negligible risk for the man and the environment at the laboratory scale. This class includes, beside organisms whose harmlessness was proven, strains which can be allergens and opportunistic pathogens. Class of risk 2: micro-organisms that can cause human disease and might be a hazard for directly exposed persons; they are unlikely to spread to the community. There is usually effective prophylaxis or treatment available. Class of risk 3: micro-organisms that can cause severe human disease and present a serious hazard for directly exposed persons. They may present a risk of spreading to the community. There is usually effective prophylaxis or treatment available. Class of risk 4: micro-organisms that cause severe human disease and are a serious hazard for directly exposed persons. They may present a high risk of spreading to the community. There is usually no effective prophylaxis or treatment available. Class of risk 2: micro-organisms that can cause disease in animals and present, at different levels, one or other of the following characteristics: limited geographical importance, no or weak interspecific transmission, no vectors or carriers. The economic and or veterinary significance is limited. There is usually effective prophylaxis or treatment available. Class of risk 3: micro-organisms that can cause serious disease or epizootics in animals. Interspecific diffusion can be important. Some of these pathogenic agents require the installation of sanitary regulations for species indexed by the authorities of each country concerned. Medical and/or sanitary prophylactic measures are available. Class of risk 4: micro-organisms that cause extremely serious panzotics or epizootics in animals with a very high mortality rate or dramatic economic consequences in the affected farmingregions. Either no medical prophylaxis is available or only one exclusive sanitary prophylaxis is possible or obligatory. Class of risk 2: micro-organisms that can cause plant disease, but that does not present an increased risk of epidemic in the event of accidental dissemination in the Belgian environment. They are ubiquitous pathogens for whom prophylactic and therapeutic means exist. Nonindigenous or exotic phytopathogen micro-organisms which cannot survive in the Belgian environment because of absence of hosts or plant-targets, or favorable climatic conditions also belong to the class of risk 2. Class of risk 3: micro-organisms that can cause in the plant a disease of economic or environmental importance for which treatments are non-existent, difficult to apply, or expensive. The accidental dissemination of these micro-organisms can increase the risks of local epidemics. Exotic stocks of micro-organisms usually present in the Belgian environment and not listed as quarantine micro-organisms also belong to this class of risk. A microorganism, nucleic acid, or protein that is either a) not capable of causing human or animal disease; or b) capable of causing human or animal disease, but unlikely to do so. Those capable of causing disease are considered pathogens that pose a low risk to the health of individuals or animals, and a low risk to public health and the animal population. RG1 pathogens can be opportunistic and may pose a threat to immunocompromised individuals. Due to the low risk to public health and animal population associated with RG1 material, there are no physical or operational requirements for handling them. Nonetheless, due care should be exercised and safe work practices (e.g., good microbiological laboratory practices) should be followed when handling these materials. A pathogen or toxin that poses a moderate risk to the health of individuals or animals, and a low risk to public health and the animal population. These pathogens are able to cause serious disease in a human or animal but are unlikely to do so. Effective treatment and preventive measures are available and the risk of spread of diseases caused by these pathogens is low. Examples of RG2 human pathogens are included in Schedule 2 of the HPTA. population, however, can range from low to high depending on the pathogen. Examples of RG3 human pathogens are included in Schedule 3 of the HPTA. A pathogen that poses a high risk to the health of individuals or animals and a high risk to public health. These pathogens are likely to cause serious disease in a human or animal, which can often lead to death. Effective treatment and preventive measures are not usually available and the risk of spread of disease caused by these pathogens is high for the public. The risk of spread of disease to the animal population, however, ranges from low to high, depending on the pathogen. Examples of RG4 human pathogens are included in Schedule 4 of the HPTA. Group 1 biological agent means one that is unlikely to cause human disease. Group 2 biological agent means one that can cause human disease and might be a hazard to workers; it is unlikely to spread to the community; there is usually effective prophylaxis or treatment available. Group 3 biological agent means one that can cause severe human disease and present a serious hazard to workers; it may present a risk of spreading to the community, but there is usually effective prophylaxis or treatment available. Group 4 biological agent means one that causes severe human disease and is a serious hazard to workers; it may present a high risk of spreading to the community; there is usually no effective prophylaxis or treatment available. (See also Official Journal of the European Communities No L262/21 dated September 18, 2000.) Article 2. Definitions; Article 18. Classification of biological agents; Annex III.Community Classification. Introductory Notes). Risk Group 4: biological agents which cause severe human disease and are a serious hazard to workers; the risk of spread in the population is high under certain circumstances; there is usually no effective prophylaxis or treatment. Risk Group 3 Biological Agents which can cause serious disease which is of high risk to the individual. Description is the same as First Schedule Part I but they also have the potential to be weaponized. Risk Group 4 Biological Agents which can cause severe / lethal disease, easily transmitted and of high risk to the individual and the community. These agents have the potential to be weaponized. Risk Group 2 Biological Agents that need special attention in large scale production. All Risk Group 2 Biological Agents (including those in Third Schedule) which cause disease in humans. Microbial toxins that have the potential to be weaponized. Group 1 Unlikely to cause human disease. Group 2 Can cause human disease and may be a hazard to employees; it is unlikely to spread to the community and there is usually effective prophylaxis or treatment available. Group 3 Can cause severe human disease and may be a serious hazard to employees; it may spread to the community, but there is usually effective prophylaxis or treatment available. 1. Advisory Committee on Dangerous Pathogens. 2013. “The Approved List of biological agents” 3rd Edition. Health and Safety Executive – United Kingdom. 2. Australian/New Zealand Standard AS/NZS 2243.3:2010. “Safety in laboratories Part 3: Microbiological aspects and containment facilities”. 4. Bundesministerium der Justiz und für Verbraucherschutz. 2013. “Verordnung über Sicherheit und Gesundheitsschutz bei Tätigkeiten mit Biologischen Arbeitsstoffen (Biostoffverordnung - BioStoffV)”. 6. Centers for Disease Control and Prevention & Animal and Plant Health Inspection Service. 2017. Select Agent Program - Select Agents and Toxins. 8. Government of Canada. 2016. Canadian Biosafety Handbook, Second Edition. 10. Singapore Ministry of Health (MOH), Biological Agents and Toxins Act (BATA). Updated Biological Agents and Toxins List. 11. World Health Organization. 2004. “Laboratory Biosafety Manual”. 3rd Edition. WHO, Geneva.